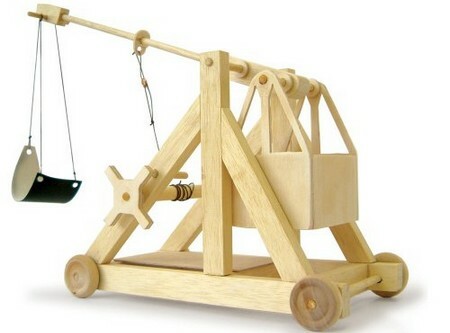 During the medieval times, trebuchet was used to hurl stones and boulders on the castle walls. Nowadays, these weapons are made just to have some fun. 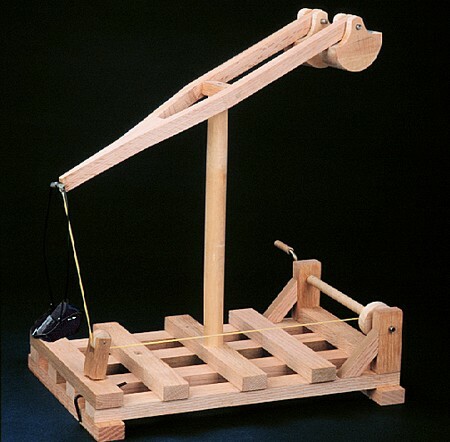 Here is a stepwise procedure to build a tabletop trebuchet. The first thing that is needed is a long piece of wood. Cut the plank into 8 pieces in such a manner that one piece is the longest, one pair is slightly shorter than the longest one, one pair a few inches shorter than the first pair and the remaining three pieces are of the same size. Take a square piece of wood, and cut it along the diagonal to obtain two equal sized triangles. Take one piece of wood from each pair and affix them on to the longest piece such that they are at ¾ length of the longer piece. Fix the second pair in the similar manner. To the attachment just made, fasten the triangle in such a manner that the slanting side of the triangle is towards the longer side. Affix the other triangle in the same way to the other attachment. When all the arms and triangles have been fixed properly a rectangular setup would be obtained. The third arm has to be attached at the point where the base and the upright arms meet. Affix all the pieces of wood properly with the help of nails. Mark the position of the holes for the axle in the upright arms. The cylindrical metal rod is ideal for the axle. The length of the axle should be equal to the distance between the two upright arms. For making the swinging arm, drill three holes on the longest piece of wood. The first hole is at a point that is approximately ¼ the total length of the piece. The remaining two holes are about 2-inches away from the first hole. Insert the axle in any one hole and near the holes fix a hook for the counterweight. On the opposite side fix a nail, cut its head and bend it to form a loop. Away from the nail on the same side fix another hook. On this hook the projectile would be fastened. For the counterweight, clay or discharged batteries can be used. Use tape and plastic to wrap the counterweight and hang it to the hook with a piece of yarn. Take two pieces of yarn that are 20-inches in length. Tie one end of the rectangular fabric with one length and the other end of the fabric with the other yarn length. The middle portion of the fabric is left as such to hold the projectile. A small piece of metal wire is twisted to form a loop and this is tied to the free end of the yarn. The loop is placed over the bent nail. The free end of the other yarn is tied to the hook on the swinging arm. With this step, the trebuchet is ready for use. All that needs to be done is to load the projectile and release the swinging arm. There is nothing as simple as building a water rocket. 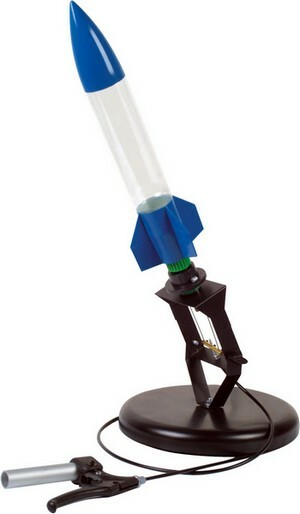 To make an impressive and working rocket, abide by the following step by step procedure. The tools that will be required are hacksaw, scissors, pliers, and electric drill fitted with 1/2-inch bit. The materials needed for the project are 1/2-inch PVC pipe that is 10’ long, 1 1/2-inch PVC pipe that is 2’’ long, 1/2-inch PVC tee, 1/2-inch PVC end caps, PVC cement, candles, plastic cables, cotton string, duct tape, 2L soda bottles, replacement tire valve and clamp for 1 1/2-inch hosepipe. With the help of hacksaw cut 10’ long PVC pipe into three parts measuring 78’’, 18’’ and 2’’. Use the electric drill to make a hole on the top of the PVC end cap. Take the replacement tire valve and unscrew the small cap and put it on one side. Insert the valve into the hole of the end cap and push it so that it sticks out at the top. Screw back the small cap on the valve. Pull the end of the valve with the pliers until it is firmly seated on the top of the PVC end cap. Keep PVC end cap, 18’’ PVC pipe piece, PVC tee, and 78’’pipe piece in a straight line and connect them together with the help of PVC cement. To the leg of PVC tee attach the 2’’ pipe piece. Put a mark on the pipe assembly that is 11-inches from the open end of the assembled pipe. Use the candle to heat the pipe evenly over the mark. When the pipe softens at the mark, push it inside to create a small bulge. Hold the pipe straight until the bulge hardens. This bulge will act as a seal between the soda bottle and pipe. Use the duct tape to put nine cable ties together. Ensure that all the cable ties lie parallel to one another. Moreover, their head should be lined up evenly and they should face the same direction. Slide the soda bottle over the pipe and seat it over the bulge. Tie the cable ties around the pipe such that the head of each tie holds the lip of the bottle tightly. Place the hose clamp over the duct tape to make sure that the cable ties securely stay in this position. Take another soda bottle and cut its top and bottom. Flatten the bottle and drill 1 1/4-inch hole on either side. This will form the spring that will keep the trigger in position before the launch. In 2’’ long scrap PVC pipe drill a small hole and tie one end of 4-feet long string. Remove the bottle from the pipe. First slide the spring on the pipe assembly and thereafter slide the trigger. Pass the string through the holes of the spring. Use the duct tape to tie the other end of the string to the pipe assembly. Fill about 1/3rd of the bottle with water and slide it over the pipe. Pull the string of the trigger so as to allow the bottle to rest properly on the bulge. Release the string so that the trigger holds the bottle in place. To the valve at the PVC end cap attach the bicycle pump and pump about 60 to 65 psi into the launcher. 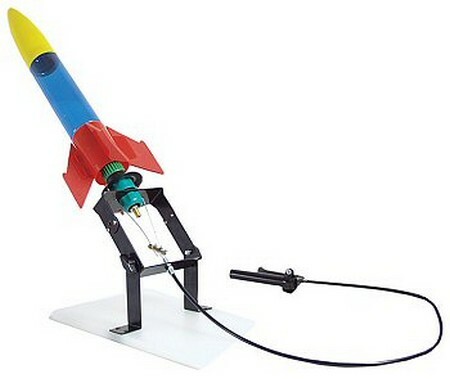 Adjust the position of the launcher and pull the string; the water rocket will blast off immediately. Also called go-cart or simply cart, a wooden go-kart is a vehicle that is not self-propelled. It has to be pushed forward. The steering mechanism is exceeding simple; either the driver uses his feet to steer the vehicle or the front axle is rotated with the help of rope to change the direction. All in all, a go-cart literally means loads of fun, not just for kids, but also for adults. With the right set of tools and materials, the cart can easily be made. 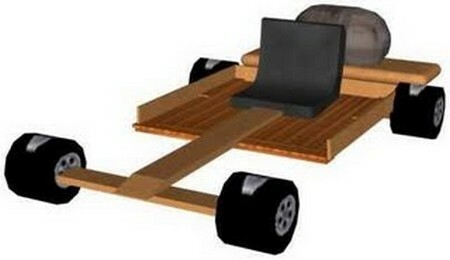 Here is a step by step procedure to build a go-kart of wood. The first step is to collect appropriate tools and materials for the project. The tools that will be needed are hammer, spanner, hand saw, electric drill, metal hacksaw and measuring tape. The materials that will be required for the project are 3’’ x 4’’ wood plank, 1’’ x 4’’ lumber, 4-spoked wheels, 15mm round metallic bar, 2’’ and 5’’ round nails, washers, bolts, nuts and split pins. The hardest part of material collection is to find spoked wheels. They can be obtained from old prams and small bicycles. 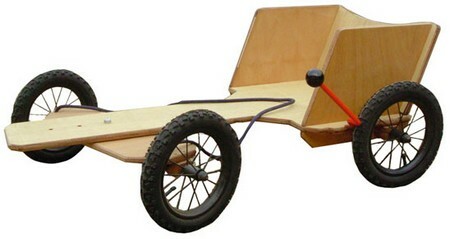 A standard go-kart is 1.2m in length and 0.7m in width. The dimensions are completely alterable. The height of the cart depends upon the diameter of the wheel. Wheels of 270mm diameter are considered to be ideal. The front axle moves left and right, and can easily be controlled by the rope attached to its either end. The first thing that should be made is the main chassis. It should be of dimensions 1250mm x 75mm x 100mm. The length of the chassis is not critical, but it should certainly allow the front axle to move freely without hitting the seating area. The front and rear axle are embedded in the axle cover, which is 550mm in length, 75mm in depth and 100mm in width. A 15mm x 15mm groove is made in the cover in which the 15mm axle is perfectly accommodated. The front support cover together with the axle is attached to the main chassis by 12mm bolt. The bolt is not over-tightened so as to allow the axle to move freely left and right. In the metal axle four holes are drilled. The two holes in the middle are 400mm apart and they help the axle to be securely affixed to the wooden cover. The remaining two holes are at the end for the split pins. These pins keep the washers and wheels in place. To ensure that the wheels stay in place, insert a washer first on the axle followed by the wheel and another washer. Lastly the split pin is placed in the hole. Do remember to apply grease in the region where the wheel moves. This will prevent wear and tear. The rear axle is attached to the chassis with the help of round nails. The last thing that has to be made and assembled is the seat of the cart. Once that is done the wooden go-kart is ready for use. 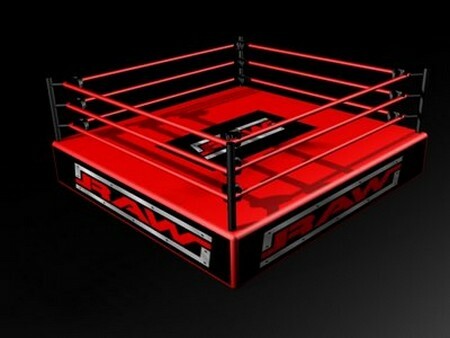 Wresting is a popular and exciting sport that can be enjoyed even in the backyard provided a proper ring is available. Building a wrestling ring is not a difficult task. If requisite materials and tools are in place, then the project can be completed within a few hours. Here is a stepwise procedure to build a superlative wrestling ring. In the first step, a suitable location should be found for the ring. Thereafter, all the dirt, grass, weeds, sharp objects and debris should be removed, and the area should be properly leveled. The next thing that has to be done is to measure the dimensions of the cleared area. In simple words, the size of the prospective ring has to be measured, and the size depends upon the amount of space available. Take 2-inches thick foam and cut it according to the dimensions of the ring. If 2-inches thick foam is not available, then stick two or more thinner sheets together. At all costs the thickness shouldn’t be less than 2-inches. In the next step, cover the foam on all sides with waterproof material. The edges of the covering shouldn’t have any gaps; otherwise the rain water can penetrate inside and spoil the foam. If possible use sewing machine to seal the edges. Take a piece of plywood and cut it in such a manner that it is equal to the foam in dimensions. Lay the plywood on the cleared ground; it will form the base of the ring. Place the foam over the plywood and paste the two together. Mark the four corners of the plywood on the ground. In each marked region dig a hole that is at least 1-foot deep. Place the corner post in each hole. Pour some cement in the hole and fill up the remaining space with dirt. Leave the posts as such for 24 to 48 hours to allow the cement to dry. Cover each post with foam. Either glue or elastic bands can be used for this purpose. Thereafter place a hook on the outer corner of the post. Measure the height of the hook so as to ensure that the height of the other hooks on the remaining three posts is also the same. The ropes that form the outer boundary of the ring are attached to these hooks. The number of hooks on the posts depends upon the number of ropes. Typically, 3 to 5 ropes are attached. 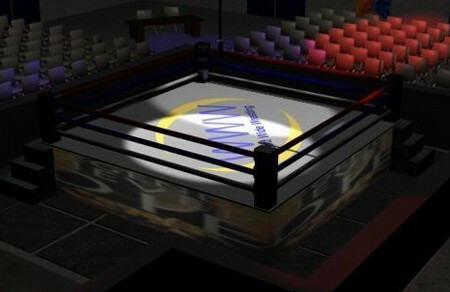 Once the ropes have been tied, the wresting ring is ready for use. Isn’t it cool if you can be like a rock star and jump on the stage, strumming on your own handmade guitar? You can be your own luthier to build your dream guitar but it requires long term investment. A handmade guitar is very time consuming as it can take up months to build a high quality guitar and you will need to spend a lot of money on the tools. If you have good woodworking skills, the time and money to spare, it can be a very good hobby for you. But, what if you do not know how to build a guitar? Fret not as this article will tell you what to do to build your own guitar with a full set kit. The first thing you will need to do is to sketch out the design of your guitar. 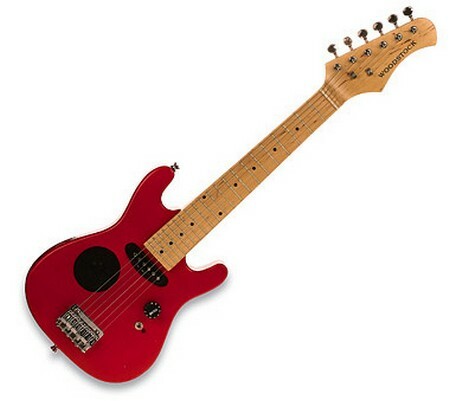 Determine the desired sound, size, the type of neck and the bridges you want for the guitar. A vector drawing program can be very useful at this stage as it will accurately sketch all the components of the guitar. If you do not have a plan or design in your mind, you can always purchase guitar kits online. These kits are perfect for novice guitar builders who do not have the basic knowledge of how to build a guitar. There are thousands of kits in different shapes and sizes for you to choose from. These kits usually come in precut pieces of eucalyptus or masonite wood and it will greatly reduce your working time. In the package you should have all the parts you need to build a guitar. 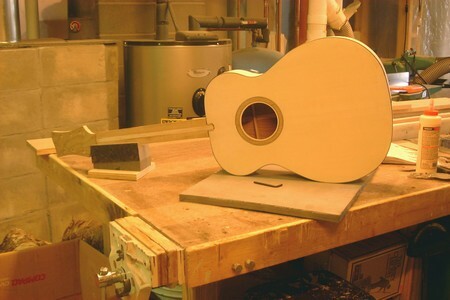 You will need to apply model cement or glue to the pre-bent sides and attach them to the guitar’s base. Spread glue along the lining and beware not to put on too much glue as parts are very thin. Secure the pieces after applying the glue with wooden cam clamps and rubber bands. Let the glue set and dry up before you proceed to the next step. Repeat the same procedure to attach the top after inserting the body into the form. Then, install the adjustable trust rod to the neck by applying glue and allow it to dry. Place the neck on the body and glue the thin piece of wood that comes in the kit to the metal part of the truss rod. It provides an even gluing space for the fingerboard and has to be scraped down to level with the guitar. Glue the fingerboard onto the neck and place the neck back to the body. It should be able to fit perfectly, otherwise, trim off the access wood with sand paper after the glue is completely dry. You will want to apply an extra coating of permanent finish for better protection. Install the bridge onto the correct position mentioned in the manual. Slot in the nuts and shape the saddle to the right height. Tune the guitar and you are ready to go!